Terra Natura Benidorm – Whilst visiting the Costa Blanca region, be sure to take your family along to Benidorm for a visit to one or more of its amazing theme parks. One very special place is the Terra Natura wildlife park which is one of the most popular attractions in the region. Set in 320,000m2 of parkland the Terra Natura offers the opportunity to view many different species of animals, and you can also interact with some, for instance you can swim with the sea lions. The park has four themed areas, the Europe area, the Asia area, the America area and the Pangea area. In surrounding resorts you can often find discount tickets for the Terra Natura and in summer 2011 there is a promotion offering tickets from just 10 euro, with the option to call back the next day free. So get yourselves along to the Terra Natura in Benidorm and have a great time. Other great attractions in Benidorm include Aqualandia, Terra Mitica and the Mundomar Marine Animal Park. Whilst traveling around the Costa Blanca region this year make sure you take a day out to visit the wonderful Rio Safari Elche, a unique and enjoyable animal park with a ‘train’ ride and some entertaining animal shows to enjoy, including an elephant show a parrot show and a sea lion show. Feeding the animals is allowed, with monkey nuts and carrots for sale in the park shop, and the kids love feeding the giraffes and the hippo especially. You can also take a ride on a camel or a donkey and visit the farm animals section with cows, pigs, goats, horses and sheep. Afterwards why not head into the city of Elche which is especially famous for its palm tree forest, containing hundreds of thousands of palm trees. Cabo Roig Marina – Boating fans visiting the Costa Blanca in the near future, should consider mooring up at the fantastic Cabo Roig marina – one of the best regarded marinas on this popular coastline. Located in an attractive area it has over two hundred mooring spaces, a restaurant and some other good facilities. The marina is right beside Cala Caleta beach and meandering above the marina is the pretty Cabo Roig to La Zenia cliff walk. The exact co-ordinates for the marina are 37º 54’ 04’’ N 0º 43’ 5’’ W. Access Cabo Roig marina from the N332 or exit the AP-7 motoway at La Zenia. Lighthouse Picture at La Manga – Beautiful picture of a lighthouse, located at Cabo de Palos close to La Manga, in the Murcia region of Spain. A lovely spot to visit if you are in the Costa Calida region, make sure you go and enjoy a coffee in the pretty harbour nearby. Cabo de Palos is at the start of the La Manga strip. One of the favourite pastimes for visitors to the Costa Blanca is browsing around one of the many local markets, a great place to buy fresh produce, leather goods and gifts. Certainly for women (if my wife is anything to go by! ), this will be on the top of their list of excursions whilst on holiday. Read this excellent guide which outlines where and when you can find the best local markets on the Costa Blanca, Spain: Costa Blanca Markets. There are plenty to choose from, and there should be at least one in your local area, wherever you are staying on the Costa Blanca. Map of Cabo Roig Spain – A little extra help for you if you are visiting Cabo Roig in Spain this summer, an excellent map which will help you find your way around the resort. This map of Cabo Roig shows the main access to the resort via the coast road known as the N-332, and also showns the AP-7 Autovia, which you may use if arriving from the direction of either Alicante or Murcia airport. The easiest place to get off the Autovia (motorway) for Cabo Roig is the La Zenia exit (if coming from Alicante direction), and the Dehesa de Campoamor exit if arriving from the direction of Murcia airport or Cartagena. Tortilla Recipe – Looking for a traditional Spanish dish to cook, that is easy to do and doesn’t take too much time, then why not try the Tortilla? The tortilla or Spanish omelette is one of the best known dishes in Spain, commonly served in tapas bars it is easy to make using simple ingredients. The tortilla is tasty and filling and is delicious served hot or cold with a salad. It is fun to make, very filling and you can also experiment by adding new ingredients which you fancy. For a list of the traditional ingredients and a tried and tested tortilla recipe you can take a look at our dedicated webpage: Tortilla Recipe. Map of Los Balcones Torrevieja – Handy if you are visiting the Costa Blanca urbanization of Los Balcones this interactive map will help you to find your way around the area, which is located beside the Torrevieja salt lake to the south of Torrevieja town. 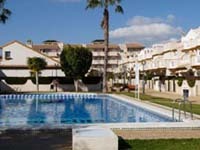 Also close by Los Balcones are the areas of Los Altos, Dream Hills, Los Montesinos and Punta Prima. Great places to visit – the healing mud baths of Lo Pagan. If you are visiting the Costa Calida, in the Murcia region of Spain this year you should take time out to visit the famous healing mud baths at Lo Pagan – completely free for visitors to use, these well laid-out mud baths include wooden platform areas with steps for elderly and disabled visitors. The hot healing mud is renowned for its healing properties and can be very helpful for a variety of ailments and skin complaints. To get to Lo Pagan follow the N-332 from Torevieja or the Orihuela Costa and turn off just before San Pedro del Pinatar, by the roundabout with the little boat, Lo Pagan is clearly signposted. Get there early to get parking nearby, it can get pretty busy in summer time and parking spaces are limited close to the beach, though there is plenty of parking before you get to the beach.